The New York Cosmos are back on top of the North American Soccer League, but Jacksonville Armada FC did not make it easy – not by a long shot. An own goal created by a long-distance strike from Raúl and an impressive individual effort by Hagop Chirishian gave the unbeaten Cosmos (5W-5D-0L, 20 points) a 2-0 first-half lead against the Armada FC on Saturday night before 7,353 fans at Shuart Stadium in Hempstead, N.Y. Visiting Jacksonville (3-2-5, 12) closed out its first season in the league with a second-half rally to tie the match on two goals by Pascal Millien. Forward Lucky Mkosana then scored what looked to be the winner in the 86th minute for the Cosmos, but Jacksonville refused to fold. In the 89th minute, Joseph Toby one-timed a corner kick to tie the match, but that is the way it ended. 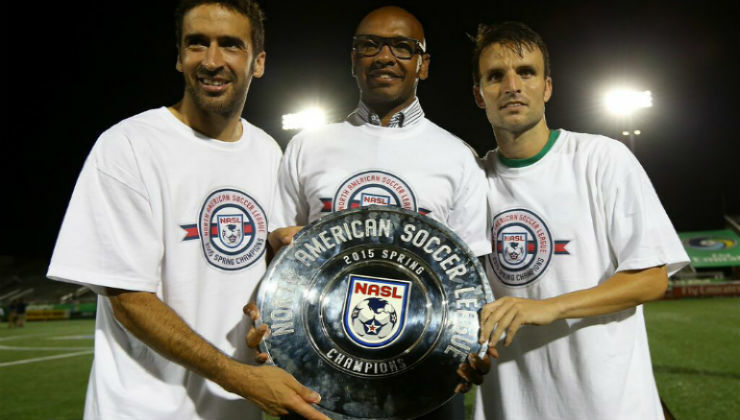 The single point in the 3-3 draw enabled the Cosmos to win the Spring Season Championship and ensure themselves a home game in the league’s playoff semifinals in November. The Cosmos needed only a draw against Jacksonville to clinch the title, regardless of the result between the second-place Tampa Bay Rowdies and Atlanta Silverbacks. The Cosmos quickly jumped in front, benefiting from an own goal in the sixth minute on a play keenly initiated by the club’s Spanish star Raul. After chesting a ball to his left foot about 30 yards from goal, Raúl sent a looping shot that struck the Jacksonville crossbar, bounced down and off the leg of goalkeeper Miguel Gallardo and into the net. Chirishian, who was playing in his first league match of 2015, calmly settled a cross from Danny Szetela and skipped around Gallardo before calmly tucking the ball into the back of the net. Jacksonville made it interesting when it cut the Cosmos’ lead in half in the 59th minute. Millien and Jemal Johnson worked a neat give-and-go in the Cosmos area that resulted in Millien, a Haiti international, beating goalkeeper Jimmy Maurer for his third goal of the season. Millien did it again in the 73rd minute when he took the ball from Szetela and slotted a left-footed shot past Maurer to tie the match. The Rowdies ended up doing their part, defeating the visiting Atlanta Silverbacks, 3-0, but ultimately fell a point short of their long-time rivals, the Cosmos. Elsewhere, Indy Eleven won its second straight under interim head coach Tim Regan, coasting to a 3-0 win over FC Edmonton. Miguel Ibarra scored in his final league match for Minnesota United, but Fort Lauderdale struck for two late goals and held on while a man down to win, 3-2. Down in San Antonio, Ottawa increased its streak to 526 minutes holding the opposition without a goal in a scoreless draw against the Scorpions. The Rowdies went out with a bang, but the unlikely series of events the Rowdies (5-4-1, 19) needed to overtake the Cosmos never materialized. Tampa Bay needed a Cosmos loss, but New York was already ahead of Jacksonville before the game kicked off in St. Petersburg, Fla. But the Rowdies did all they could, picking up three points and closing its goal differential with the Cosmos (the first tiebreaker) to only 3 goals. The Silverbacks (1-5-4, 8 points) and Rowdies played on, oblivious to the seesaw affair on Long Island, with the Rowdies scoring first on Corey Hertzog’s goal in the 60th minute. Hertzog, who scored his second goal of the season, used his chest to direct a cross by Darwin Espinal past Steward Ceus. Martin Núñez scored on a clinical, bending free kick in the 75th minute and Georgi Hristov tucked in a penalty kick in the 89th minute. Indy Eleven scored two goals in the first half and defeated FC Edmonton (2-3-5, 9) before 10,202 at Carroll Stadium in Tim Regan’s second match in charge as interim coach. Indy (3-4-3, 13) received goals from Brian Brown and Dylan Mares in the first 45 minutes, and Duke Lacroix added a third in the 82nd minute. Indy closed out the season with two victories after coach Juergen Sommer was dismissed and replaced by Regan. Loons midfielder Miguel Ibarra, playing his final full match before 9,342 fans at the National Sports Center in Blaine, Minn., scored a goal as he closed out his NASL career in a loss by Minnesota (3-5-2, 14) against the Fort Lauderdale Strikers (3-2-5, 11). The visiting Strikers, bidding to break a five-game winless streak in the league, scored first when Stefano Pinho converted a pass from James Marcelin. The Loons went in front in the 38th minute when Aaron Pitchkolan headed in a cross from Kevin Venegas. Late goals only minutes apart by Fort Lauderdale’s Jose Angulo and a second by Pinho helped the Strikers end their losing streak. After a red card to Angulo, several sparkling saves in the final 10 minutes by the Strikers’ Josh Ford preserved the victory. 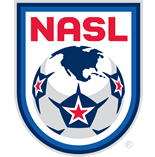 Ottawa ran the NASL Modern Era record of holding the opposition scoreless to 526 minutes as it played to yet another scoreless draw. Ottawa (2-4-4, 11) has scored only one goal during that five-game streak. Fury FC allowed the fewest goals (5) in the league’s Spring Season. San Antonio (3-3-4, 12), a finalist last year, finished a disappointing Spring Season with only one win in its last five games.